Take 25% off your purchase of $40 or more. Or, take 15% off your purchase, no minimum. 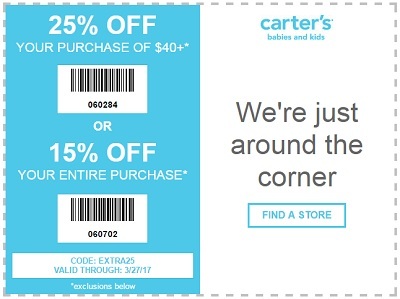 Offer is valid at U.S. carter's stores, with printable coupon. Source of the information is carter's. Offer is valid until March 27, 2017. More details available at any U.S. carter's store or carter's online. (total: 264)G.H. Bass & Co.